The I.R.S. is trying to make itself more helpful by giving us an app for our phones. The most disliked department in our government is keeping up with modern times. This new app will not help you to avoid taxes, but it will at least keep track of your refund. 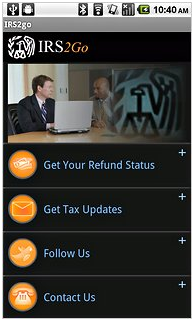 The IRS2Go app, introduced on Monday, lets filers check on the status of their refund from their phone and get daily tax tips. The free app is available for the iPhone and phones on the Android system. I think it's great the stogy old I.R.S. is taking advantage of modern technology to be a little helpful to us. The app is pretty slick with a nice interface. I checked out the iPhone version and it's pretty easy to use. It has 4 buttons consisting of a Get your refund status, Get tax updates, Follow online, and Contact us. To check the status of their refund through the app, users enter their Social Security number, which is encrypted for security. They then select the filing status they used along with the amount they expect to receive in their refund. People who file online can check the status of their refund 72 hours after they receive an e-mail from the I.R.S. confirming that it has received their tax return. Those who file paper returns must wait up to four weeks. Additionally, users of the app can sign up to receive tax tips it promises will be in “plain English,” about topics like child tax credits and education credits. They can also sign up to follow the I.R.S. Twitter feed. Isn't that special, the I.R.S. is on twitter. I hope they go on Facebook because I can't wait to add them to my friend list. At the present time there is not an app to file your return by the I.R.S. Though Intuit does have such an app, but only if your using the 1040EZ form. I can't wait to see what they come up with next. Maybe a tax audit app. I'd like a app that would actually track how the money is spent that I'm forced to give the IRS so I don't get sent to jail. I think that would be very enlightening for each taxpayer. Hey thanks for the tip! Good to know IRS is keeping up with the times! Anything to make life a little easier helps. Grouch, I don't think one app would we able to provide that info. It might even just crash the device if ever used.